West Lake tops Hangzhou's list of attractions. In fact, a bicycle ride around the area is the perfect introduction to the city. Visitors will find many lovely parks, most with free admission. The Prince Bay Park is particularly beautiful in March and April, when the tulips and cherry trees are blossoming. Nature lovers should also stop at the Lingyin-Felai Feng Scenic Area. This stunning forested and mountainous area is home to Lingyin Temple: the Temple of the Soul's Retreat. The numerous sculptures carved into the mountain are some of its treasures. Hangzhou is also full of interesting museums, including the History Museum, the Hangzhou Lianzhu Cultural Museum and the National Tea Museum. The area is famous for its green tea and, apart from the museum, travellers may want to visit the Hangzhou Longjingshan Tea Cultural Village, where they can learn to make and serve tea using traditional methods. Travellers more interested in simply enjoying the tea, and various other culinary treats should visit Hefang Street: a delightful old Chinese pedestrian shopping street bustling with shops and stalls. This street offers all the usual touristy stock, but also has a few charming restaurants and teahouses. 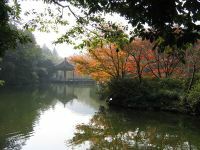 We are looking for contributors for our Hangzhou travel guide. If you are a local, a regular traveller to Hangzhou or a travel professional with time to contribute and answer occasional forum questions, please contact us.